Here is a guide you can use to speed up your WordPress site and potentially rank better. Optimizing websites using Google’s Page Speed Insightcan be a worth while exercise to cut some fat in your websites file structure. Matt Cutts Says Google Is Incorporating Site Speed In Search Rankings. With over 200 ranking factors, Google doesn’t give up very many freebies for webmasters. Not only does Google tell us they want to see quick sites, but they give us a tool to test our site’s speed and suggestions to fix slow site performance. Quick note: I know people hip to SEO will pick up on the claim about site speed and ranking. Site speed is only one of hundreds of factors that Google considers when ranking pages. If your page ranks well already and has a slow load time that is okay. In fact, if you look at sites like Facebook, Twitter, Techcrunch, and CNN using Google’s Site Speed Insights they have low site speed scores. If your competition has fast site speed and you make these changes there is a chance you may or may not rank better. However, if you are like me and enjoy optimizing your website and giving yourself the best chance you can to rank better in Google search results, read on. Let’s see this site’s results. So we can see there is some room for improvement to speed up my WordPress site. Let me quickly talk about how this website is built so we can discuss what we can fix, what we should fix, and what is going to be a little tricky to fix. This site is built using a WordPress theme called Casper. Because it is built with WordPress there are 3 ways in which files are created in the webserver directory. It is important to know which files are coming from where. If you have a plugin that is causing a slow page load, or other issues it might be worth finding another plugin versus fixing it. Also, we know we can use some CDN functionality with large files but if it is a file that we might change often (like a style.css file) it can be quiet annoying. We know for sure that we can compress, resize, and use ajax when possible to help with this speed score. So let’s get into it. Warning: You should always backup all of your files before making any big changes. Here are a few suggestions for plugins you can use if you are using WordPress. First let’s download the W3 Cache plugin. 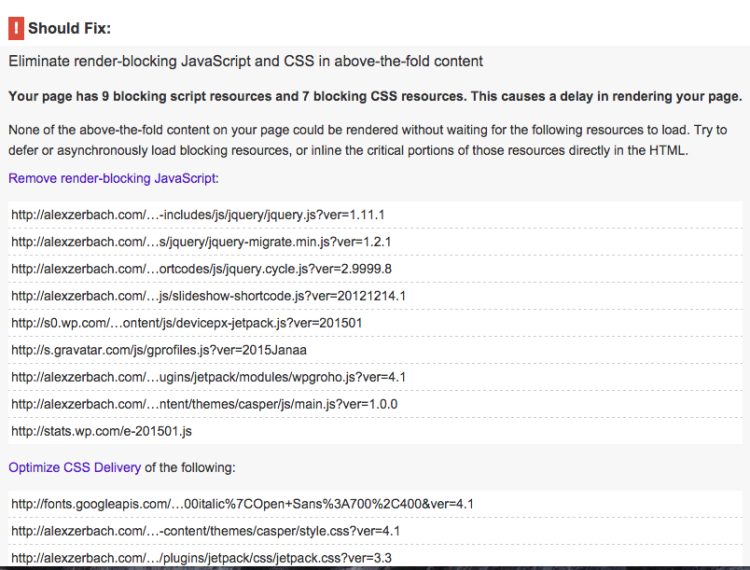 You can do this by going to your site’s dashboard then plugins then search for W3 Cache. In the settings I went to general to first enable some services. This is the most common method I have found to speed up your WordPress site. Go back to your Page Speed Insights and find which files Google is asking you to remove. If you hover over them it should give you the file path. Add theses files to your Minify Settings. Make sure the JS file Management option has your current theme. 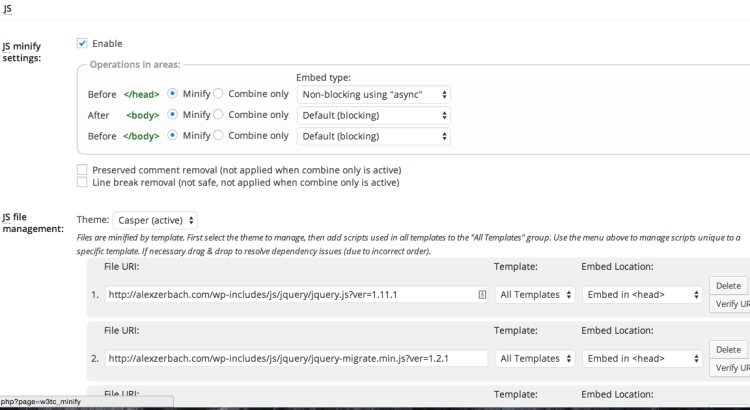 Upload each file and keep the Template option as All Templates, select Embed in <head> and verify it does not wreck your site. I would suggest doing it one by one and seeing if any functionality on your site breaks. If it does. This method will not work. There are some files (like Google Fonts) that you won’t want to minimize. Did this help speed up your WordPress site? 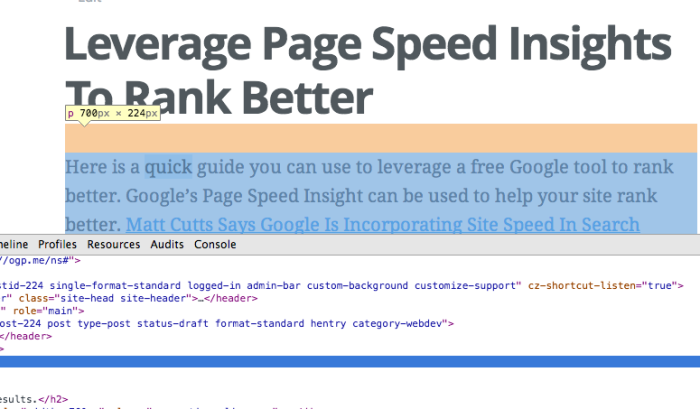 Google offers PageSpeed service which optimizes your site before a request is made. It stands in the middle of your site and the http requests. This may be a little complex for users who are knew to websites and servers. However, it has been report that this will speed up your WordPress site. You will need to be comfortable with configuring DNS records. Here is a video with a little more information. I already fixed the top priorities but I might be keen to revisit this service at a later date. Another great way to reduce server resources is to make website images sized to exactly the size as they are needed. Often times webmasters take a very large image upload it, don’t add alt tags, or a title tag and add them into their post. 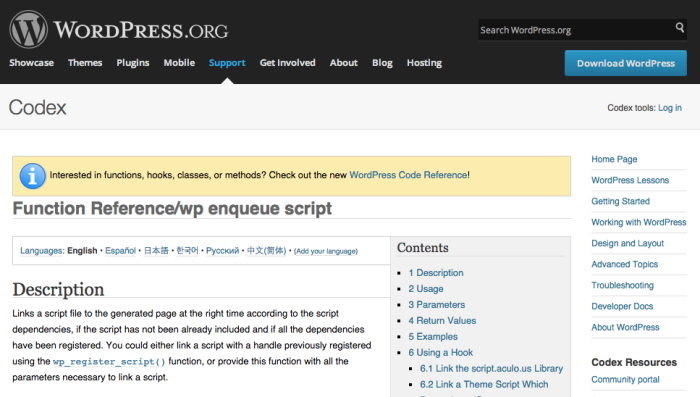 This is not how to speed up your WordPress website. The best way to handle images from an SEO stand point is to optimize them. Here is my workflow for handling images in my posts and on my site. This may or may not be best for you. Find the width of your blog’s content region by right clicking and using inspect element. When I add photos to a blog I always give it a descriptive title, alt tag, description, and caption. Even if I know I have to go back and edit it later. I want to get as much potential out of the image as possible and I know if I leave it blank I might not come back. Plus it makes organizing pictures easier. I then scale photos to be max-width of the blog, so in my case 700 pixels. This is a good practice so that images aren’t being resized and the reduction is done before they are requested from the server. Here are a few other ideas if you are looking to squeeze a little more performance out of some available resources to speed up your WordPress site. These options may or may not be a good idea based on your theme or comfort level with code and websites. I use a CDN for a few single page sites but they are built with a bootstrap like theme and were fairly straightforward to set up. A CDN is a (content delivery network) way to host files on servers all across the World. When a user visit a site they are served the files from the nearest server available. A CDN network reduces strain on a server’s bandwidth and allows a user to be served files quicker. Here are a few suggestions for popular, well supported, and stable CDN’s. 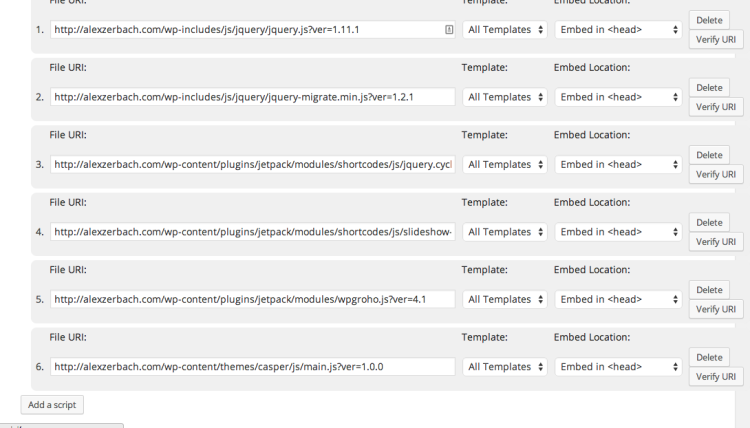 Also, the W3 Cache Plugin from above has the ability to configure a CDN. Amazon CloudFront – Amazon is spending a lot to bring users resources and tools for the web. Definitely worth a look. How Much Load Are Your Plugins Putting On Your WordPress Site Speed? I love looking at how plugins are constructed. Nerdy yes, time consuming definitely. One thing I have learned is a lot of issues can arise from a poorly coded plugin, or a handful of plugins stepping on each others toes. It can be very frustrating to deactivate all your plugins one at a time to find a culprit that is breaking something on your website. Maybe it is time to see if you actually need all your plugins or if some can be deactivated in order to help speed up your WordPress site. The P3 plugin is great for looking at performance and load. I quickly noticed a big issue with Jetpack when I scanned my site for the first time. At first I realized just how many resources Jetpack was using. For me it was totally not worth it because I use Jetpack for very little, I only installed it because I enjoy a few features I could get elsewhere. So I was keen to uninstall Jetpack. But I did a little digging and I am glad I did. Jetpack actually doesn’t hurt my site’s performance like I thought. If I uninstall JetPack yes it would help my sites performance but not enough only shaving a couple milliseconds per visit off of my time. For me I will look to optimize elsewhere. However, this plugin would be ideal for someone who has old plugins that may be poorly coded, not maintained, or otherwise useless and causing your WordPress site to slow down. 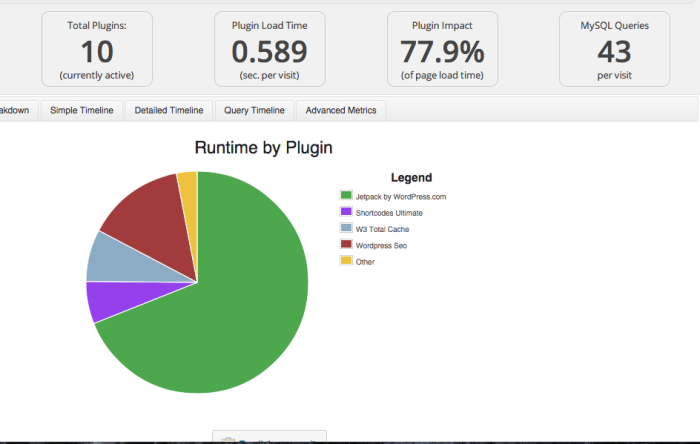 Speed up your WordPress site by checking plugins and evaluating if you really need all of them. If you can resize an image, move a file to the footer, or zip a folder and compress files then do it. 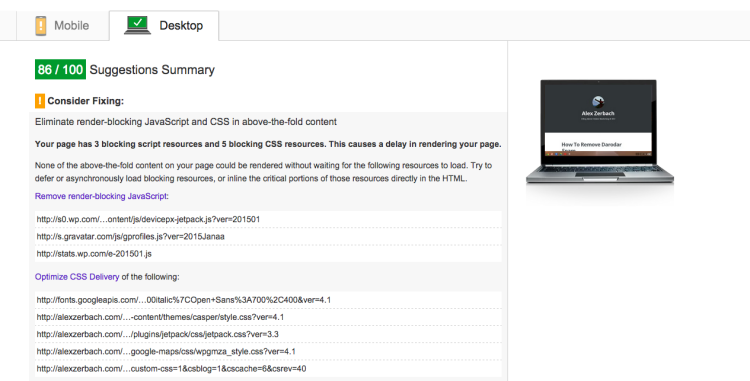 Look for CDN options when looking at stylesheet and boilerplate templates. Also consider using a theme that talks about these as a best practice and coded into the theme. Lastly, I want to just point out a well known, well used resource. This is probably not helpful to anyone reading this post because if you know how to use these chances are you are already using them but in the off chance you have lived under a rock your whole life here is Google’s hosted library collection. It can be tough to rank for content these days. It seems the market is cornered by big name brands pushing out massive amounts of filler content. SEOs are continually talking about engagement, page authority, and how content is truly king. Your best bet to rank well is to build solid backlinks from content authorities, do everything you can to make a user’s experience awesome, and deliver highly relevant content. Using a tool like Google’s Page Speed Insight is a great way to get ahead of some well written blog posts that are suffering from slow site speeds. Again, this may or may not help you rank higher if the competition is ahead of you but it can’t hurt. Really, as sad as it is to admit to yourself, if you can’t rank for a keyword phrase by having a nice blog with good content because there are others doing it better you have to find a way to stand out. So keep working, keep learning, and keep trying to find the perfect blend of content, marketing, and technology.